>Before there was the insidious sour mix you find at every bar there was lemon juice and there was simple syrup. I never buy any of these premade mixes, I just make my own. Recently I found some Meyer Lemons at a local grocery store, a rare find! Meyer lemons are a cross between a regular lemon and a mandarin orange. They’re very fragrant and slightly sweet. If you see them just buy them, very worth it. I also have a bottle of agave nectar on hand that I use sometimes as a liquid sweetener; it has it’s own interesting flavor (from the cactus) and it falls lower on the glycemic index. Which means that it’s better for you than sugar. Not that I’d go crazy for with it, but it’s a nice liquid sweetener (or simple syrup) substitute. I also think it causes less of a hangover. In fact I’ve had a martini at a very fancy restauraunt that was specifically made with agave nectar. 1) In a lowball glass (or whatever) add lemon juice and agave nectar and stir till nectar is completely dissolved. 3) Fill with ice, and stir. If you can’t find Meyer Lemons (and you probably won’t since they’re already out of season) add 1-2 Tbsp of tangerine, tangelo, or mandarin orange juice. I’m not sure I can truly describe how delicious this is. I can, however, promise that you’ll never buy sour mix again. Yuck! >I made this dessert awhile ago and completely forgot to blog about it. Totally my bad. I had some people over for dinner for the first time in about 2mo and I got overly excited and made an overly fancy dessert. Here’s hoping that I didn’t scare them off! In truth it wasn’t a difficult dessert to make. 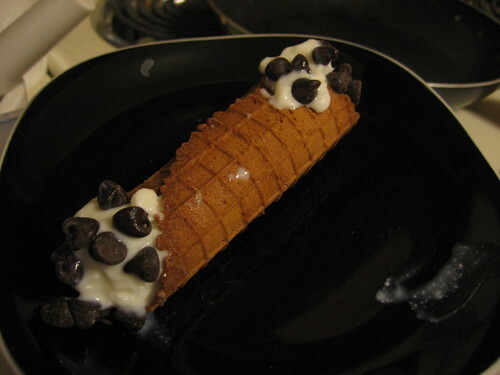 Obviously it’s a cannoli-knock-off. The shell is just David Leibovitz’s basic ice cream cone recipe from The Perfect Scoop. Instead of rolling it into a cone I rolled it into a shell (which is actually easier). The ice cream is Giada DeLaurentis’ Ricotta Ice Cream which is also easier than regular ice cream because there’s no egg-based custard involved. Just a simple syrup mixed with the ricotta and chilled before freezing in the machine. The chocolate chips aren’t actually very good with the ice cream since they get too cold to melt in your mouth. But, they’re traditional (would subsititute with chocolate syrup next time). Don’t fill the shells until just before serving so they don’t get soggy. I did it by putting the ice cream into a plastic bag and cutting off the tip. I needed help from my friends. They didn’t complain! Anyway, it’s a very cute easy fun dessert. Maybe too fancy but whatevs!